19012015_The_Rise_Of_Germanys_New_Right_0010: The Rise Of Germanys New Right: Made in Germany: Hermann Bredehorst - editorial and portrait photographer Berlin, Germany. 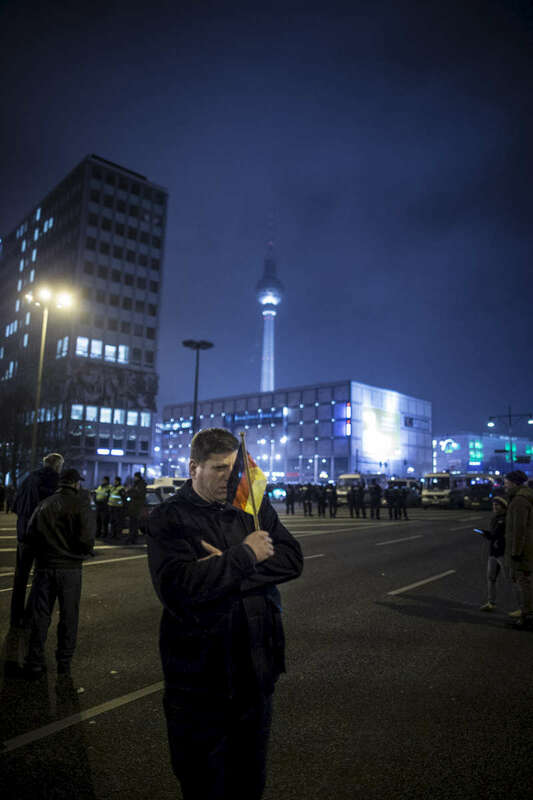 January 19, 2015 -Germany, Berlin, Berlin: Anti-Islam protesters march during a BERGIDA rally, a local copycat of Dresden's right-wing populist movement PEGIDA (Patriotic Europeans Against the Islamisation of the Occident), at Alexander Platz in Berlin, eastern Germany. The planned Dresden demonstration rally by the anti-Islamic Pegida movement was banned by German police with other public open-air gatherings in the eastern city of Dresden on Monday, citing a terrorist threat.